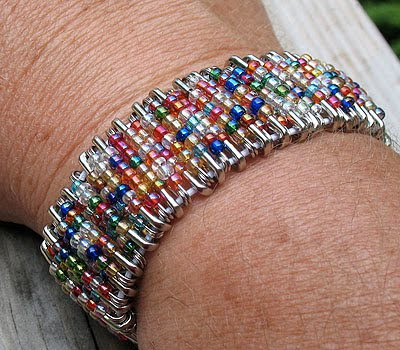 My daughter came to me one day and said she saw these really cool bracelets made from safety pins and beads. As luck would have it, I had just seen one as well so I promised to make her one. She wanted one made with smaller pins than the one she had seen, so I bought 3/4″ safety pins for mine. Notes: Make sure you do the needle nose plyer step, don’t skip it. I was walking through WalMart and felt something poking me. I discovered that two pins on my bracelet had come open, all the beads had fallen off, and then were stabbing me as I walked. Also, made sure you get cord that will fit properly through the safety pin head and bottom. 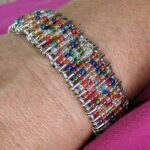 I used elastic beading cord. 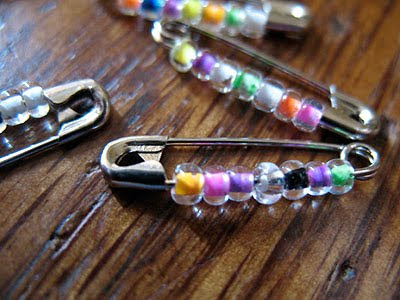 Open a safety pin and thread as many seed beads on as you can, leaving enough room to close the pin. Fasten the pin and squeeze it together using needle nose pliers to keep it from opening. 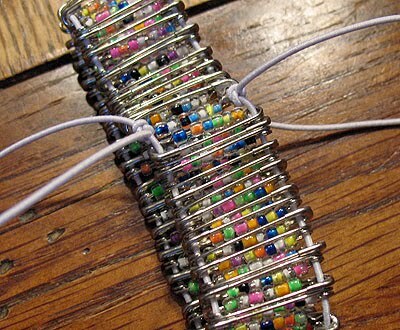 Continue this process until you have enough pins for your bracelet. Cut two pieces of elastic beading cord, about 12″ long each. Line them up evenly and loosely tie together at the end. This is just temporary so that your pins don’t fall off the other end as you thread them on. Thread one of the cords through the head of a pin, then the other cord through the bottom of the pin. To ad the second pin, reverse it, so that your pins alternate, top, bottom, top, bottom. Be sure that the beads are all on the same side as you work or you’ll end up taking a bunch of pins off and starting over (trust me on this ha ha!). When you have enough pins to create your bracelet, remove the knot from the tied end. Bring the bracelet together to create a circle. Tie the top cords together and the bottom cords together. Trim all but about two inches off the cords. Tuck remaining cord into the underside of the pins and add a little bit of glue. Let dry. Put some glue on a paper plate, about the size of a quarter. 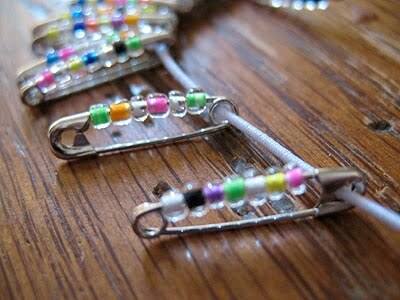 Open a safety pin and thread as many seed beads on as you can, leaving enough room to close the pin. Dip toothpick into the glue and use it to add a dot of glue to the end of the pin, then fasten. 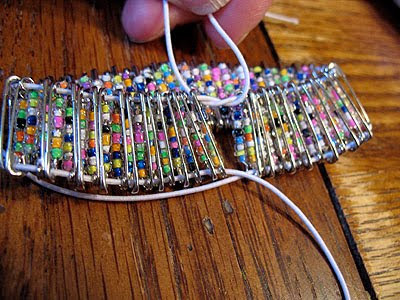 Continue this process until you have enough pins for your bracelet. Cut two pieces of elastic beading cord, about 12" long each. Line them up evenly and loosely tie together at the end. This is just temporary so that your pins don't fall off the other end as you thread them on. Thread one of the cords through the head of a pin, then the other cord through the bottom of the pin. To ad the second pin, reverse it, so that your pins alternate, top, bottom, top, bottom. Be sure that the beads are all on the same side as you work or you'll end up taking a bunch of pins off and starting over (trust me on this ha ha!). When you have enough pins to create your bracelet, remove the knot from the tied end. Bring the bracelet together to create a circle. Tie the top cords together and the bottom cords together. Trim all but about two inches off the cords. Tuck remaining cord into the underside of the pins and add a little bit of glue. Let dry. That’s great Linda, hope you have fun! You’re welcome Aurora, so glad it was helpful! 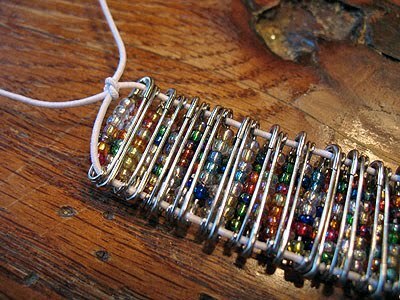 I just made my first safety pin bracelet! It was fun to make and turned out really cute. I teach middle school Home Economics and I am sure this will be a big hit with the kids! Thank you so much for sharing. Amanda, Instead of using glue to secure the pins, I use a pair of needlenose pliars & pinch the ends of the pins together after I close them. Sue that is so smart! Thank you for that tip, I will add it to the instructions! I use to make these all the time as a kid. They are a great project when you get grounded! Thanks for the steps:)… YOU ROCK!!! 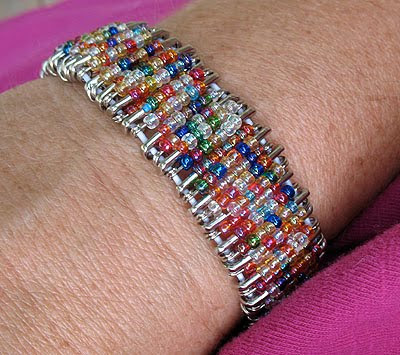 this beaded braclet is a fantastic idea… could be used in nursing homes too for the more active elders there .. i had dont a braclet similar to this eons ago of the flag.. when getting ready for the 4th of July .. so yea there are many such holidays ppl could celebrate with using this fine idea in bead making .. enjoy ya’ll… cheers ! Chica – LOL! I burn myself with my glue gun all the time too. Occupational hazard? ?